Promise of spiritual equipping, coaching and mentoring for worldwide campaign to prepare CEOs, C-level executives, founders/owners of small-and-medium-sized-enterprises (SMEs), Kingdom Companies, governments, private-sector global business leaders, and the professions to demonstrate His ways by teaching, coaching, and providing principle-centered leadership, and business solutions universally to the marketplaces, workplaces, governments, cities, and nations around the globe. 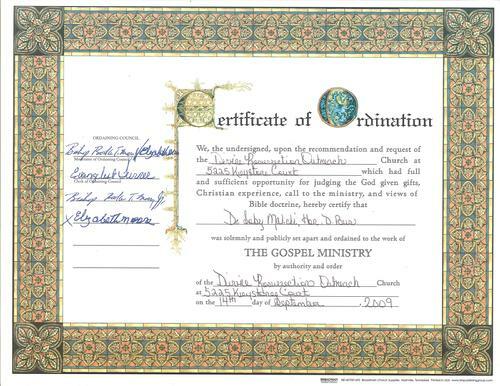 Certificate of Ordination: Dr. Toby Malichi, Hon. D. Bus. Malichi Marketplace Ministry – Nurturing the Global Sea of Souls© founded in 2005 on the biblical-principle Galatians 6:10 (NIV) is a privately funded international marketplace ministry who’s global mission is to build Gods' Kingdom Economy through principled-centered business and leadership solutions, and practices which includes sage advice, spiritual insights, expert marketplace and workplace coaching, mentoring, and private chaplaincy to business owners and their employees, C-level executives, government officials, private-sector global business leaders, and the professions in a strictly personal, confidential and private forum - conducted in a safe environment with the utmost respect and professionalism. Malichi Marketplace Ministry (MMM), has advised, spoken, inspired, coached, and conducted 'Roundtables' in the international marketplace and workplace for over 14 years around the around the globe. MMM also provides in-house international marketplace and workplace chaplaincy services for spirit-led insights for advising, listening, equiping, and inspiring business owners and their workplace employees, who are experiencing a greiving, troubled or heavy heart through loss of a child, divorce, addiction or a sudden career change, etc. We also provide business and financial-centered biblical principals, and expert trusted advice to founders, C-level executives and private-sector global business and political leaders from all facets of business, industry, governments, and the professions who seek inspiration, sage advice, insight, direction, and principals-centered leadership and business solutions, strategies, and practices - to prosper, innovate, energize, and grow their businesses, governments, cities, nations, and purpose - for the marketplace and workplace. We regularly present leadership breakfast forums called “Breakfast for Believers”© that integrates Solomon-like solutions in a roundtable and highly interactive discussion format for resolving member’s needs, exploring their greatest opportunities or getting advice on their toughest issues. Our Virtual Board of Directors provides wise business counsel for its members. Dr. Toby Malichi, Hon. D. Bus., Malichi Marketplace Ministry (MMM) Founder, Trusted Advisor, and internationally-recognized Marketplace Chaplin is empowered by God for the business world to walk in an 'apostolic authority' in the marketplace, ordained with a 'Kingdom Authority' and entrusted with the riches of the Kingdom - will share his vast personal and business experiences, knowledge, and sage advice at MMM "Breakfast of Believers" Forum on the discipline of getting things done through prayer, belief and unshakable faith in Christ Jesus our Lord and Savior. “But seek ye first the Kingdom of God, and his righteousness; and all these things shall be added unto you” (Matthew 6:33 KJV). The Breakfast of Believer’s Forum will invite a guest believer from the marketplace, government or the professions to share their testimony, message or case studies with members and how God turned their situation around for His glory and good. We place a high priority on each member working actively to round out their personal and business Purpose by “giving back.” Each member is encouraged to make positive contributions in the areas of the marketplace i.e. business, government, and education, family unity, and community / spirit / development. We also require each member to participate in a formal Malichi Marketplace Ministry project i.e. building Kingdom alliances to give rise to the poor in the marketplace, members using their leadership capacity to help influence others through programs such as mentorships, leadership and business development programs, speaking circuits, etc. Members are also encouraged to initiate and participate in new enterprises that respond to the most urgent business, cultural and socio-economic needs (homeless, food, jobs) of both local and international communities. Malichi Marketplace Ministry is seeking Kingdom-minded business and government people to join us as we pursue the vision of bringing the knowledge of God to marketplaces, workplaces, and nations, across the globe, “As the waters cover the sea” (Isaiah 11:9 KJV). Say Yes to Success Seminars™ will teach Believers in the marketplace and workplace, the skills and Biblical principles necessary to succeed to the glory of God. “Roll your works upon the Lord [commit and trust them wholly to Him; He will cause your thoughts to become agreeable to His will, and] so shall your plans be established and succeed.” (Proverbs 16:3 Amplified). The Say Yes to Success Seminars™ are spirit-led and conducted by Dr. Toby Malichi an internationally-recognized inspirational and motivational speaker, trusted advisor, and marketplace chaplin. “SEE, I will send my messenger, who will prepare the way before me. Then suddenly the Lord you are seeking will come to his temple; the messenger of the covenant, whom you desire, will come,” says the Lord Almighty.” Malachi 3:1 (NIV). Direct: +1.317.515.8866 anytime day or night! Our motto: "We doze, but never close"